A High School or College graduation is an accomplishment worth celebrating! As you honor your special graduate, you want everything to be perfect! So, why announce their big event with cheap-looking or generic invitations from a “big box” office supply store – when you can have elegant, affordable custom designed invitations form printing by Johnson! 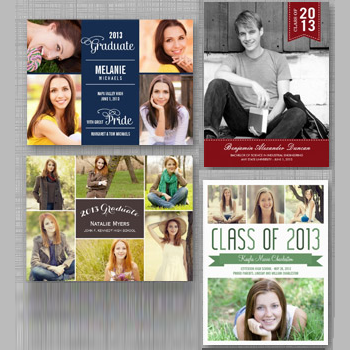 Your graduation announcements and open house or party invitations will likely be the “first impression” your friends and family have of your upcoming graduation event. Custom graduation announcements and invitations will make a statement and convey your graduate’s own personal sense of style. And, long after the occasion, your graduate will want to keep the beautiful announcement and invitations as souvenirs to remind them of their special day. Our knowledgeable and experienced graphic designers will take the time to discuss your ideas, show you print and paper samples, and help you select the announcements and invitations that reflect your graduate’s personality. Then they will create a unique custom design that will incorporate your event’s theme and conveys all of the pertinent information. Whether your graduate’s style is classic or contemporary – or elegant or edgy – we can create the perfect custom design that celebrates this momentous occasion in his or her life.